This photo has been sitting in the files since last September because I wasn't sure what it was. I'm still not sure. Lee thinks they might be crocus. They look like volunteers - like the cyclamen that I'm trying to encourage to take over my lawn. Hard to tell in the photo if the leaves belong to the flowers. I don't love dandelions or those long stemmed things that look like dandelions but I love the other volunteers that show up in my yard. Right now I have a beautiful, lush green sidewalk of almost fluorescent moss. The cyclemen are doing well, and the split leaf maple is getting way too big. Wouldn't mind some of these purple beauties. These are fall crocus. They have little purple flowers in the fall and develop beautiful glossy fronds during the spring. 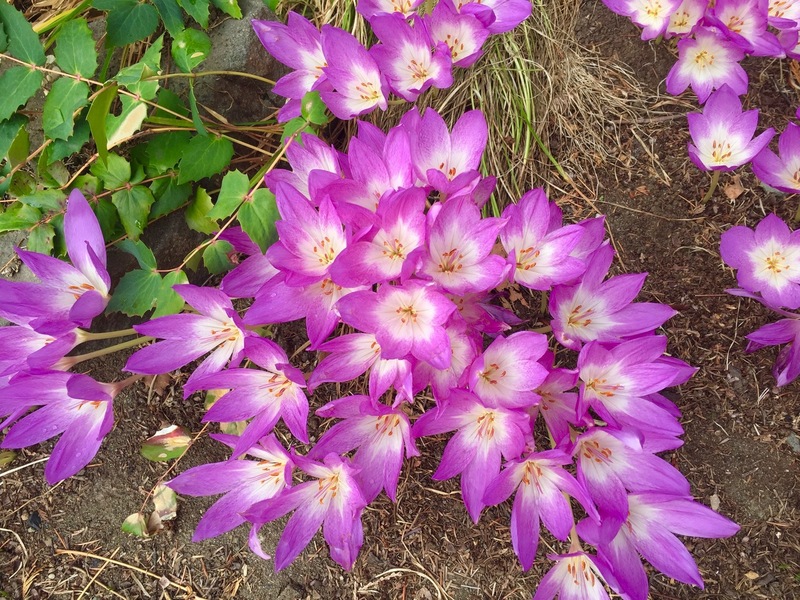 Fall Crocus! The leaves emerge around spring, then disappear in the summer and in the fall the flowers appear!